I wanted to make a sleeveless pullover with a V neck so I looked through the patterns I had for the mid gauge machine and there were a couple of sleeveless V neck pullovers but they were in stocking stitch and I wanted to do it in tuck stitch so I got out my lk 150 instruction book and looked for the how to make a tension swatch, I made a tension swatch in a tuck pattern that I just made up on the fly. 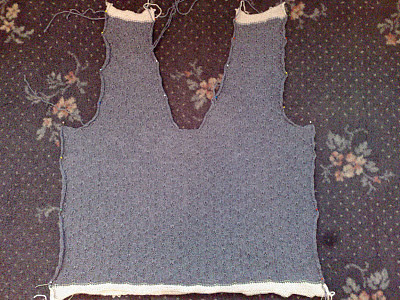 I designed the pattern using knitware and so far I have knitted the back and the front, I have put the ribbing on the back but I still need to put the rib on the front so I will do that this afternoon. So here is the completed back. 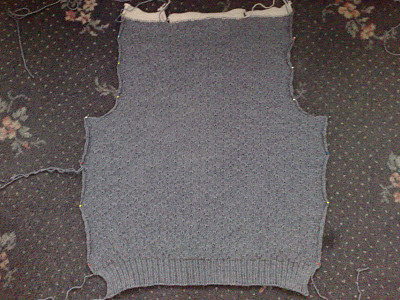 And here is the front, I thought the neck looked way to big but then I though, the the rib needs to be knitted around it so that will fill up some of the space but we'll see. I almost forgot here is a close up of the tuck pattern, the advantage to hand manipulated tuck stitch is that you can position it where ever you want, meaning that you can choose not to have the tucks going all the way to the edge therefore it is easier to sew up. the disadvantage is it takes longer because you have to keep stopping to select the needles. Do you have a ribber for the LK150 or do you do it by hand and then attach it? 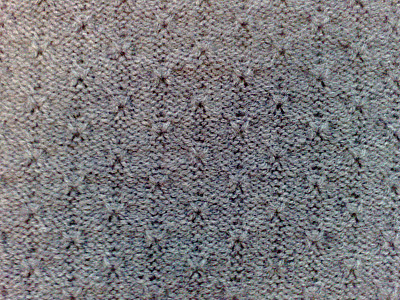 I am asking because I am going to attempt a sweater on the Knitsmart machine I bought which is similar to a Bond. It says you can rib on the machine by dropping stitches and using the latch tool to knit them back up. Does that work OK? Any suggestions greatly appreciated thanks! I don't have a ribber for my LK 150 entierly because they never made one for it. lol Bond do recomend that you start a sweater with waste yarn and then knit the body of the sweater, after you have knitted the body you turn it upside down and with the wrong side facing and rehang the live stitchs and knit the rib, you would then drop stitches for the ribbing and cast off using the back stitch bind off to keep it elastic. That is how I knit the ribs for all my sweaters that I don't have a ribber for. Thanks a bunch Alex, that helps a lot.